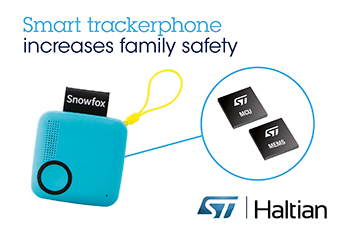 Motion-sensing and data-processing chips from STMicroelectronics (NYSE: STM) , a global semiconductor leader serving customers across the spectrum of electronics applications, help increase family safety in the Snowfox trackerphone, a two-way portable communication device with locating capabilities designed for children and seniors by Haltian, a Finnish design and engineering start-up. The matchbox-sized, easy-to-carry trackerphone maps its wearer in real time in addition to letting you reach them by calling. A simple one-button control on the device prompts notifications and call requests to family members, who can monitor their loved ones through a free smartphone app that offers various map views, location history, and event timeline. ST’s MEMS accelerometer inside the trackerphone detects the user activity to start the location measurements while the ultra-low-power STM32 microcontroller makes sure everything works reliably on minimal energy use. The outstanding real-time performance and power efficiency of ST chips gives Snowfox users the perfect balance of functionality and battery life. ST’s state-of-the-art technologies have also contributed to the success of Haltian’s hardware prototyping platform, Thingsee One, for creating new IoT (Internet of Things) products and services.